Class D duo due to delight? * as previously stated on TNT, all prices should be taken as a guide only and (YMMV). It seems only the other day that class-D amplifiers were like a mysterious new technology with prices to keep them mysterious to most of us on a modest budget. But as with most technology, the price of hi-fi equipment is falling, and class-D amplifiers are now both affordable and readily available. In fact the choice is now wide enough to make choosing the 'right' one as difficult as say a more traditional transistor amplifier. As TNT was offered two class-D amplifiers with a similar specification, it seemed like a good idea to review them both together. Yes readers, I am giving you a bonus this week. The Monrio MJ integrated and the Huygens MCD-1202 (MCD stands for "MHz Class-D") integrated are similar in size, being about half-(shelf) width, and deeper than they are wide. But such is the attention to aesthetic design that they manage to look unique, both with regard to each other, and to the many other amplifiers on the market. Both also have a very solid feel to them and the build quality is very high. No flimsy, twisting chassis with these amps, they are built like tanks. As you can see from the pictures, some care has been taken in the styling of the enclosures. The MJ has a textured matte black sleeve that gives the impression of cast iron, further adding to the sense of solidity. The attractive aluminium fascia manages to appear quite sophisticated, and yet uncluttered, at the same time. The volume control and source selector knobs are a long way from the standard cylindrical button shape found on most mass-produced hi-fi. It's a unique look that also happens to match the Monrio CD player. The Huygens comes with a smooth satin-black sleeve and matching front panel. Although the knobs are not quite so radical as those on the MJ, they too are different enough to give the amplifier its own look. An on/off switch sits between the two knobs but this only brings the amplifier out of stand-by mode. The power switch is actually on the rear panel. I personally could live with both amplifiers as regards their aesthetics and applaud the efforts of their designers to come up with something original. Both these amplifiers offer a generous number of inputs for those that need to connect more than a single source. And both use relays to select the chosen input, something that was once found only on very upmarket amplifiers. The feel of the controls further adds to the impression of a quality build. A bonus with the Monrio amp is the credit-card sized remote control that allows you to adjust the volume level from your listening position. It will also control the Monrio CDP as well. 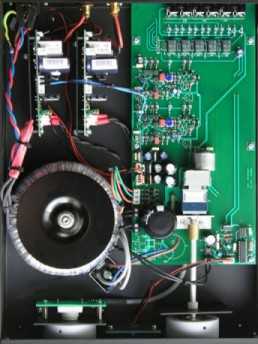 This New Class D amplifier technology runs a very high sampling rate Frequency (from around 700KHz~2. 6mhz, at a fixed frequency) . This technology enables us to produce amplifiers of high power (up to 800w) , Low THD (0. 00x% ) , Low phase-shift, and a Class A like sound all from a compact, cool running, environmentally friendly design, perfect for a HiFi, AV system, active speaker or professional amplifier. MCD amplifiers feature two feedback paths (Figure 1), one to produce the High Frequency oscillation frequency, the other for AF error feedback, this AF feedback includes the output filter to ensure load independent performance. By combining these two loops, you can create a system with both outstanding technical and subjective performance. So how do these two different class-D amplifiers sound? Well, starting with the Monrio MJ, for no particular reason, the first thing that I noticed was an impression of power. The bottom end is kept very well controlled resulting in nice tight (and tuneful) bass. The midrange is open and detailed and the top end is clear with metallic cymbals sounding metallic. Timing is good and there is no listening fatigue. The MJ produces a large, three-dimensional sound-stage, and the imaging is good. On short acquaintance, the MJ sounds like a very capable amplifier which it is. But it lacks that certain something that engages me. It would be wrong to say that it doesn't convey any emotion but it doesn't do it as well as other amplifiers. The presentation is a little 'dry' for my taste but I emphasize my taste and I wouldn't put that down as a negative. I certainly don't want to write off the MJ but the truth is that I was happy to put my own amplifier back in the system. I should also report that there is a bit of a turn-off thump with the MJ, while the relay controlled outputs of the Huygens mean that it is totally silent when powered up or down. The Huygens also 'announces' itself in a powerful fashion. I didn't think that the bass was quite as tight as the MJ but the midrange was richer in tone and the top end very good too, although again, not quite up to the standard of the MJ. Detail and timing were spot on, sound-stage was wide and deep and imaging good, although not quite as precise as with the MJ. And I found the Huygens held my interest better than the MJ. But once again, I wasn't tempted to keep the Huygens in place of my own amplifier. Like the MJ, it just didn't have enough 'magic'! Now these are the first two class-D amplifiers that I have heard (and I hope that they won't be the last). I would suggest on what I have heard from them that you will either lean toward class-D or not, rather like you may lean toward valve amplification, or linear solid state. I won't say that I don't like the class-D sound based on these two examples, and I am reliably informed that something like the UCD class-D amplifiers sound very good. So what we have here is a little disappointing given that both amplifiers are so well made and aesthetically very pleasing. But ultimately, it's sound quality and listening pleasure that must come top of the list when we look for an amplifier. Beauty, as the saying goes, is only skin deep! At the price, I feel that the MJ Monrio has got to punch higher than it does with sound satisfaction. The Huygens sells for much less but still fails to inspire me to give it a strong recommendation. In conclusion, although these are both well-made items, with a number of 'plus-points', I would advise anybody interested in these two amplifiers to audition them prior to purchase. Finally, and importantly, I must state (in the interests of safety) that at the time of writing this review, the Huygens amp had not received a European safety certificate, and even to my unqualified eyes, it would have failed to qualify for a certificate as it was supplied for the review. I understand from the supplier, that the Huygens has since been submitted for a safety certificate and is currently awaiting approval.